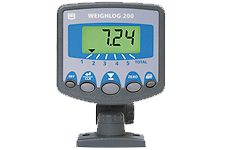 The RDS Weighlog 200 is a user-friendly on-board weighing system that can be used for a variety of applications including check-weighing incoming goods, trailer and hopper loading and batch blending. Multiple channels allow the load accumulation on different attachments, different products or customers. Ensures correct loading of vehicles or product. Can be used for weighing in all conditions. Printer compatible, allowing stock records to be kept. Speed of lift compensation allows use by numerous vehicle operators. 5 display channels available with grand total summary. Static and dynamic weighing modes for full ‘on the lift’ weighing capability. Live weight reading function for trailer weighing applications. Net bucket weight lifted displayed at any time.